Julie Kagawa, you are cruel. Brilliant, talented, amazing… but oh-so-cruel. 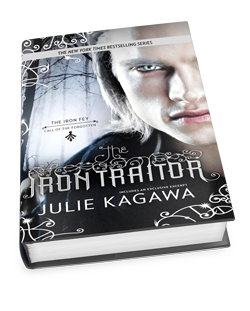 The Iron Traitor picks up not long after the first book ends. Turns out things are not super great this side of the Veil either. Ethan’s parents aren’t happy, Kenzie’s in the hospital, her dad pretty much thinks Ethan is evil incarnate, the police are suspicious and asking questions about Todd, and Kierran’s missing again. When a certain fading summer fey shows up on Ethan’s doorstep asking for his help, life just gets a little more complicated when Ethan is faced with a choice. Does he want to get involved again? Should he get involved again? And how far do you go to save someone? From there the story sweeps through Goblin markets and trods; through places earthly, otherworldly and somewhere in between. It’s populated with faces old, new, friendly, and not-so-friendly, and filled with challenging dilemmas and questionable choices, epic quests, and of course, swordfights. And everything is heightened — there’s more excitement, more danger, more adventure, the consequences are more severe, the stakes higher, and the decisions more conflicting and messy. It’s GREAT. Ethan. In The Lost Prince, I’ll admit, Ethan annoyed me. He had this whiny, sullen Luke Skywalker vibe going on that made me want to bang my head against a wall. But Ethan in book two is more determined to take control of his life. He’s matured a bit, grown up. He’s more self-assured and sure of what he wants. It’s great to see that progression in his character. Kenzie. Kenzie seems… somewhat diminished in book two. As understandable and in-character though it may be, Ethan’s constant over-protectiveness of her drove me crazy. Kenzie may be new to Faery and her health fragile, but she’s proven herself very quick-witted, intelligent and sharp when it comes to dealing with the fey. She’s not without her own set of valuable resources; she’s a great asset. Kenzie’s still a great character, but to me, her wonderful vibrancy and fire is a bit dulled in this book. Kierran. He’s a tough nut to crack and I wish the reader was given a chance to know him a little better. He’s very closed off, guarded, prickly (the apple didn’t fall far, huh? ), unpredictable, which makes him unsettling and unreliable. However, because of that he’s a very interesting character and I’m curious as to where Julie will take Kierran by the end of the series as well. Kierran & Ethan. The relationship that’s been developing between Kierran and Ethan is rather interesting. It doesn’t have the chemistry that I loved about Puck and Ash’s frenemy-ship, but it’s intriguing to watch these two young men who are on converging and diverging paths as they define themselves in both values and actions. Grim. Puck. Razor. Love, love, love them all. Overall. The Iron Traitor is a fantastic continuation in this already fantastic series — a suspenseful, fast-paced read with an (obviously) jaw-dropping conclusion.